Enforcement of Ohio’s call before you dig law began January 1, 2016. The registration fee for non-residential callers is a flat $25 this year. It may be reduced or eliminated next year. Approximately 24 complaints of potential violations have been reviewed by Public Utilities Commission of Ohio and its Underground Technical Committee. Few have been against excavators; mostly against utilities and locators. Possible law revisions include waiting 72 instead of 48 hours to give locators more time (they are swamped since enforcement began), removal of exemptions, clarifying the large complex projects process, and ticket life. The Ohio Utilities Damage Prevention Coalition is likely to meet early next year to discuss possible revisions. Al Tonetti will attend on the OAC’s behalf. Al invited a representative from the Ohio Utilities Protection Service to give refresher presentation on Ohio’s one-call process at the fall 2017 OAC membership meeting. Planning for Statehood Day, Wednesday, March 1, 2017, has begun. Last year Al Tonetti, on behalf of the OAC, suggested that Statehood Day partners pursue a concurrent resolution supporting the U.S. Government’s nomination of the Hopewell Ceremonial Earthworks nomination to the World Heritage List. This was done. In May, the House approved the resolution. It now needs approved by the Senate by end of year (end of Ohio’s two year legislative cycle). An effort to better protect human burial places in Ohio may be on this years’ legislative priorities (see below). U.S. Army Corps of Engineers (USACE), Huntington District: Continuing consultation on Consol Energy’s Meigs Mine 31 pipeline, where prehistoric human remains were discovered at 33GA387. Also in the Huntington District, the Rolling Hills Generating Station project. The OAC was asked to consult regarding resolving adverse effects to site 33MS609, a stratified, primarily Late Archaic-Early Woodland site on the Ohio River floodplain. We agreed to do so. Buckeye Lake Dam: additional information received. USACE Huntington District is the lead agency. The OAC became a consulting party on the proposed data recovery at 33HY107 for the Maumee River Crossing Bridge. A conference call with consulting parties recently occurred. USACE Buffalo District is the lead agency. The OAC is also a consulting party on data recovery at 33FR560, 33FR1303, and 33FR2349 at the Columbus Southerly Wastewater Treatment Plant. The Ohio EPA is the lead agency. The state of Ohio is selling farm prison properties. One is in Chillicothe and may affect the Shriver Circle (prehistoric earthwork). We are consulting with SHPO, Hopewell Culture National Park, and others about this matter. The Federal Bureau of Land Management is proposing selling oil and gas leases on thousands of acres in the Marietta Unit of the Wayne National Forest. There is no federal undertaking yet but we are monitoring the situation. Most members are aware that the OAC has been meeting with OHC/SHPO discussing ways to better protect certain human burial places, i.e., those not under the jurisdiction of the Dept. of Commerce, Div. of Real Estate. This is a direct result of discussions many of us have had around the looting of the trace Rockshelter in Jackson County a few years ago. Ohio is often mentioned as having the least effective laws governing the identification and protection of human burial places in the nation. This is a very complex matter that to this point has been limited to discussion between certain members of the OAC’s Board and OHC/SHPO staff, but we are close to sharing the general concept of our proposal with other agencies and organizations. Once we have a final draft of the general concept, probably by end of year, it will be brought to interested state legislators and interest groups for further discussion. Ohio Valley Archaeology, Inc., Washington City Schools, and Paul Turner received a Public Awareness and Education Award for the archaeological investigation at the Gist Settlement in Highland County. Turner is a descendant of this freed-slave community. Washington High School history teacher Paul Larue and Ohio Valley’s Jarrod Burks were instrumental in the project’s success. The archaeological research was partially funded by grants from the History Channel and Time Warner Cable’s STEM Initiative. The Ashland/Wooster/Columbus Archaeological and Geologic Consortium, Ashland University, The College of Wooster, and Ohio Valley Archaeology, Inc.’s Jarrod Burks also received a Public Awareness and Education Award for the Walhonding Valley Late Prehistoric Sites Project. The Consortium is composed of professionals, semi-professionals, and amateurs who for over 25 years have been volunteering on archaeological excavations to understand the region’s prehistory. The Cleveland Underwater Explorers and the Maritime Archeological Survey Team (MAST) received a Preservation Merit Award for the survey, recordation and permanent mooring of the Sultan shipwreck in Lake Erie. The project is a model for volunteer efforts in underwater archaeology in Ohio’s portion of Lake Erie. A grant from the Ohio Archaeological Council partially supported this project. traditional native foods prepared in a modern, gourmet style. Each year the State Historic Preservation Office recognizes achievements in historic preservation by presenting awards in Public Education and Awareness, and Preservation Merit. The Public Education and Awareness Award is for increasing interest in historic preservation. Eligible activities include, but are not limited to, media, newsletters, publications, interpretation, original research, educational programs, and special events which have substantially increased public understanding and awareness of historic preservation at the local, regional, or state level. The Preservation Merit Award is for preserving Ohio's prehistory, history, architecture, or culture. Eligible activities include, but are not limited to, restoring, rehabilitating, or otherwise preserving an important building or site, longtime stewardship of a property, promoting protective legislation, funding preservation projects, offering leadership, support, or service, and furthering preservation at the local, regional, or state level. In 2016, three Ohio archaeology projects will receive awards from the State Historic Preservation Office. Ohio Valley Archaeology, Inc., Washington City Schools, and Paul Turner, for archaeological investigation at the Highland County Gist Settlement. Ashland University, The College of Wooster, Ohio Valley Archaeology Inc., and the Ashland/Wooster/Columbus Archaeological and Geologic Consortium, for the Walhonding Valley Late Prehistoric Sites Project. Cleveland Underwater Explorers (CLUE) and Maritime Archaeological Survey Team (MAST), for the Sultan Shipwreck Mooring Buoy and Archaeology Project in Lake Erie. If you would like to meet the recipients and learn more about their achievements, the State Historic Preservation Office Awards Luncheon is being held this year on Saturday, October 29, 11:30 am - 2:00 pm at the Ohio History Center, 800 E. 17th Avenue in Columbus. Registration is $30. To register, please contact Rochelle Bailey at 614-298-2000. 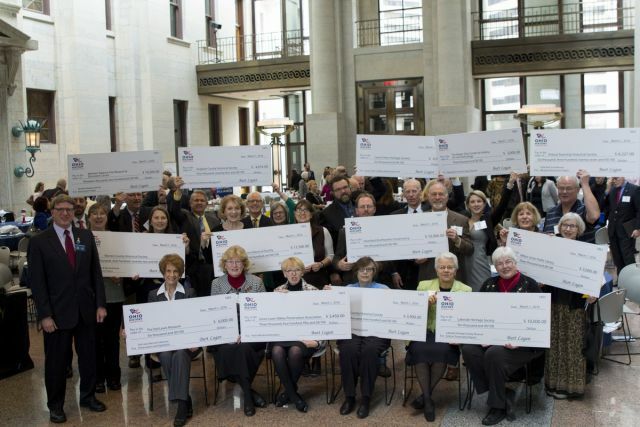 Grants for history projects from the Ohio History Fund. The deadline for this cycle’s round of History Fund grant applications is September 7, 2016. So what is the Ohio History Fund and how do I apply? The History Fund hosted two webinars this summer that explained the program and how you can write a strong grant application. Both webinars were recorded and are now available free of charge on the History Fund's website: www.ohiohistory.org/historyfund. The first webinar, "History Fund Help - Overview of Application" surveys the History Fund's grant guidelines and walks you through the application section by section, focusing on those that our grant reviewers spend the most time evaluating. The second webinar, "Digitization Nuts and Bolts," shows you how to strengthen your application for a History Fund digitization project and improve its chances of being funded, including addressing details that reviewers look for. Using real-life examples, presenters discuss standards and best practices, the importance of a well-defined project, and how to address long-term access and preservation.